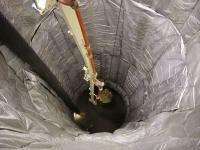 SoilFreeze has extensive experience in providing shoring for deep shafts. Tunneling machine access, deep manhole construction, equipment recovery, and mining are all common applications for frozen soil shafts. SoilFreeze maintains well-tested protocols for keeping shoring walls watertight when penetrated, most commonly by tunnel boring machines. Shaft construction may also be called for in densely populated urban developments and limited overhead construction, such as below power lines or under elevated roadways. SoilFreeze partners with highly skilled, local pipe installers to minimize social disruption during installation and maintenance. Design considerations: The deeper shafts go into soils with high groundwater, the greater the anticipated hydrostatic pressure. A critical design element, therefore, becomes how deep to install the freeze pipes (past the excavation depth) to create an unfrozen “plug” below the base of the excavation. Only the most specialized and experienced geotechnical engineer will be able to analyze the natural soils to determine the water resistance needed to a degree of certainty. Since frozen soil, like concrete, is strongest when in compression, cylindrical shafts are the most popular shape. Examples of deep shaft construction are SoilFreeze’s San Pedro and Harbor Island shafts in Los Angeles, CA. Four shafts were constructed, two 14-foot diameters and two 24-foot diameters. Each shaft was excavated to a depth of over 90 feet in beach sand with silt layers. 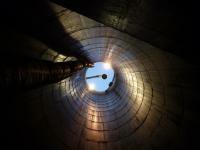 The shoring was designed to reach a depth of 120 to 140 feet to provide a watertight “plug” in the bottom, taking into account the 80 feet of hydrostatic pressure.